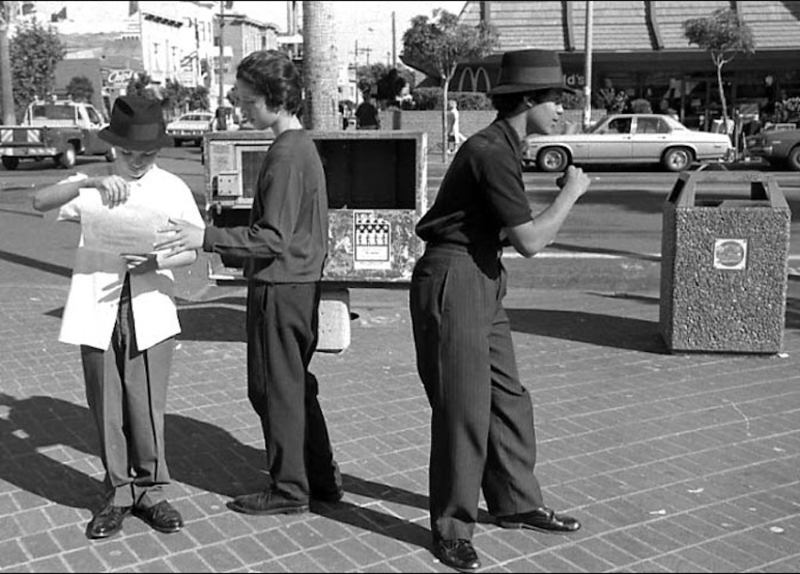 In one of Ted Pushinsky’s photos, three boys stand at the 24th Street BART plaza. Two of them wear Stetson hats, one of them dances, and all three wear baggy slacks and shined-up shoes. Two of them read a sheet of paper whose words remain hidden from view. While it is only a black-and-white photograph — one taken in the ’80s, when the McDonald’s roof was still gabled and the newsstands still provided news — it’s not hard to hear the bustling sounds of the intersection or feel a slight breeze cut through what seems like a lazy Sunday afternoon. More than anything, it’s easy to imagine yourself being Pushinsky, the fly-on-the-wall street photographer who died of prostate cancer two weeks ago at the age of 71, and who most say lived and breathed through his camera lens. Pushinsky grew up in Queens, New York, until the age of 10, when his family moved to Pennsylvania. His father’s hobby was painting, so art was a part of the family atmosphere, Pushinsky’s brother, Jon, recalled. Pushinsky went to Penn State University, studied abroad in Mexico, and, after graduating in the early ’70s, moved to San Francisco. Most who knew Pushinsky or his work said that his photos come to life because of his unique gift of becoming invisible. “He left a legacy of being able to see and experience and feel what he was doing through his photographs,” said René Yañez, co-founder of Galería de la Raza. Yañez met Pushinsky in the 1980s at The Farm, an artistic community center and punk rock venue formerly located at the corner of Cesar Chavez and Potrero. “His wife was a dancer,” Yañez recalled, “and she would do a political act” with the iconic 1970s dance collective Tumbleweed. “I met him through his wife,” Yañez said. Amanda Lopez, a Los Angeles–based photographer, said Pushinsky inspired her own photography. They met at Hamburger Eyes, a photographers’ hub in Lilac Alley, near 24th and Mission, that has since closed. Lopez said that seeing Pushinsky’s work was especially important to her as a member of the Latino community. “What especially spoke to me were the photos of the Mission, the kids and people coming up in the neighborhood,” she said. Ray Potes, a co-founder of Hamburger Eyes, said he frequently hung out with Pushinsky — at the studio and around the city. They would talk about photography and sports, Potes recalled, and would often go to lunch. Potes said Pushinsky played a huge role in building up the Hamburger Eyes magazine when it first began in 2003. He remembers Pushinsky ringing his doorbell one day at his apartment on 24th Street. It was their first meeting. “I don’t even know how he got the address, and he said, ‘I want to give you guys photos for Hamburger Eyes,’” Potes said. “His work fit right into what we were trying to do,” he said. 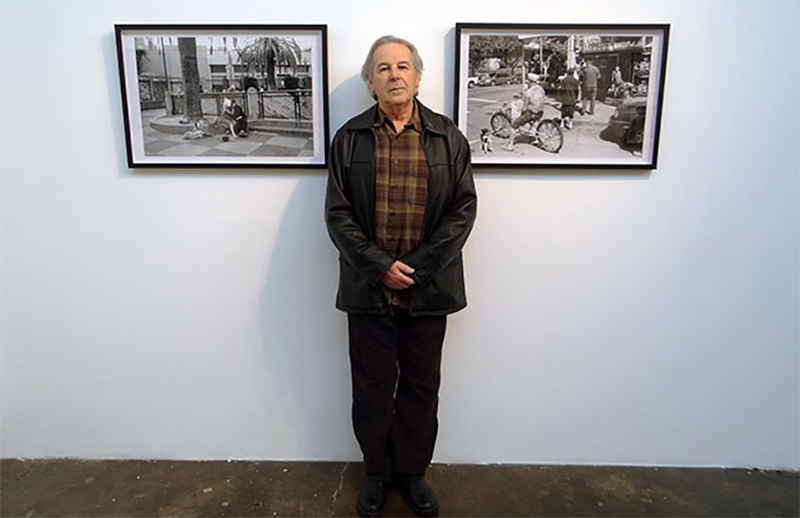 During the 1980s, Pushinsky was among the first to hang his work at the now-closed Eye Gallery in the Mission, recalled Tom Ferentz, who owns Sixth Street Photography Workshop and once co-ran Eye Gallery. “He brought in his work when we were having our first actual show,” Ferentz said. Pushinsky was a fan of jazz music, he added, and they had run into each other at jazz clubs several times. “That makes sense because of the improvisational quality of street photography,” Ferentz said. Sometime in the early 1970s, photographer Henry Wessel remembers, he and Pushinsky were standing on a street corner in the Mission, waiting for the light to change. Suddenly, Pushinsky broke away and approached two men who were having a heated conversation. Standing five feet away from them, Pushinsky took out a pencil and pad and started writing. The two men eventually moved on, and when Pushinsky came back, Wessel asked what he was doing. Pushinsky said he was gathering dialogue for screenplays he often worked on. A tribute to Pushinsky’s work runs through Feb. 24 at Acción Latina. A memorial reception will take place on Saturday, February 24th from 3-6pm at the Juan R. Fuentes Gallery at Accion Latina (2958 24th Street). This will be a free event open to the public. Visitors are encouraged to contribute anything they would like to a community altar the gallery currently has on display within his exhibition.